During my work placement at the People’s History Museum I was given the opportunity to curate a display from objects featured in the museums peace collection. The peace collection is quite extensive, containing various anti-war photographs and memorabilia. 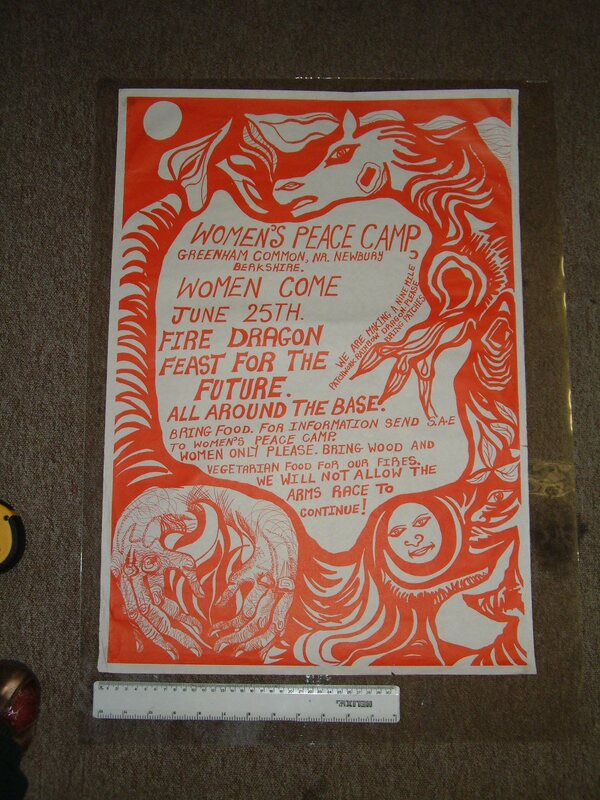 While researching the collection I found the material surrounding Greenham Common women’s peace camp to be very intriguing and decided to focus my display on the subject. RAF Greenham Common was a Royal Air Force station located in Berkshire, England that was chosen to house nuclear cruise missiles during the Cold War. 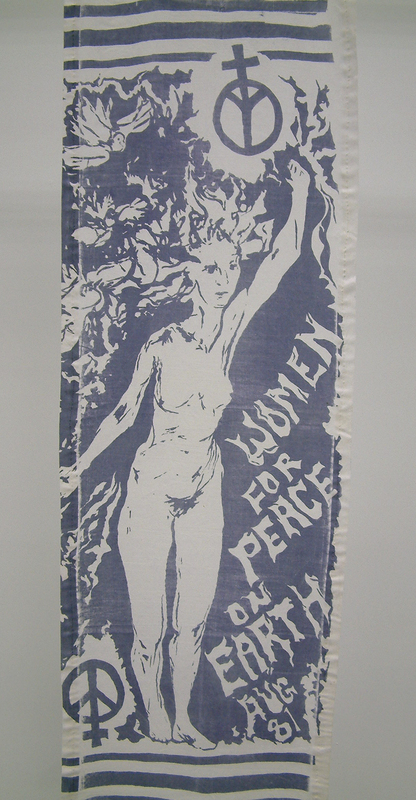 In September of 1981, the peace group Women for Life on Earth marched from Cardiff to Greenham in protest of the government’s decision. The first on-site protest occurred when the women arrived at Greenham and chained themselves to the base fence. Shortly after this, the camp was officially established. Life was not easy for the women living at Greenham Common. The conditions could be harsh since they were living outside and without electricity. There was also constant opposition from authority and the local community. Greenham Common underwent several camp evictions over the years and hundreds of women were arrested by police. The locals staged protests as well, not wanting the presence of the camp in their community. Despite the opposition they faced, the women of Greenham Common were extremely committed to their cause. They believed in a life without threat of cruise missiles and violence. 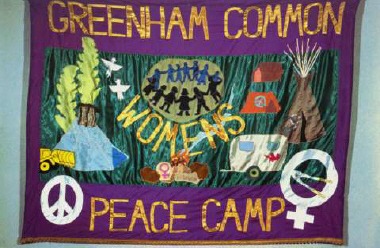 Greenham Common women’s peace camp quickly became internationally recognized, bringing a new focus to the peace movement. The last of the cruise missiles were removed in 1991, but the site remained an active peace camp until 2000. Greenham Common is now public park land. Caitlin’s exhibition Greenham Common is on display from Thursday 7 May – Thursday 28 May 2015. Last week Jenny and Zoë from our conservation team attended the Icon Textile forum. This is an annual event organised by Icon (the Institute of Conservation) which is the professional body for conservators in the UK. 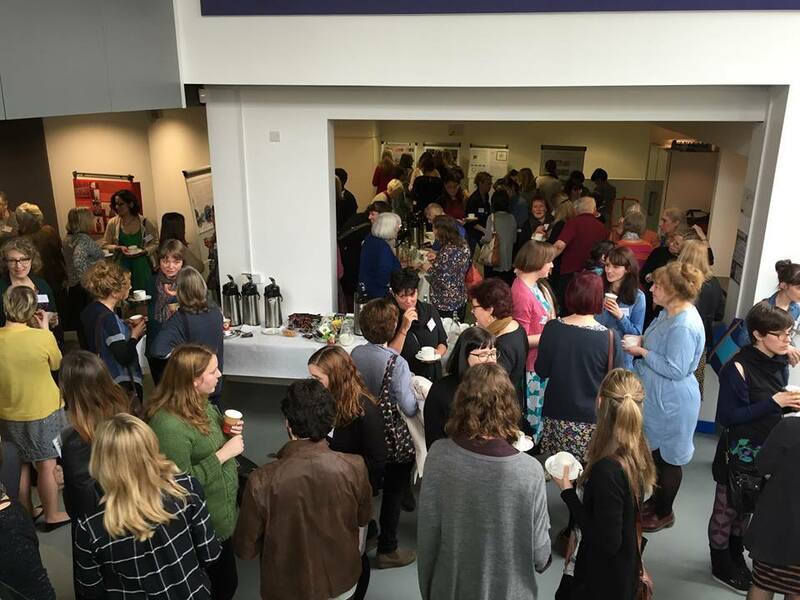 The forum is a gathering of other textile conservators from across the UK, it is an opportunity to hear presentations and see posters based on a theme which changes each year and the chance to catch up with friends and colleagues. For 2015 the theme of the day was ‘Learning Curve: Education, Experience and Reflection.’ It was a packed day with eleven papers delivered in total, with speakers from other national museums, private practitioners and students. To start was ‘Textile Education – what are we training for?’ This paper, written by Frances Lennard and Sarah Foskett reflected on the 40 years since the establishment of the Textile Conservation Centre which was originally based at Hampton Court Palace in London but is now run through Glasgow University, this training programme is currently the only place to study textile conservation in the UK producing around 9 graduates each year. The next paper delivered by Katriina Similä and co-authored with Dinah Eastop was entitled ‘Positioning: where you stand’ based around a workshop held at the International Centre for the Study of the Preservation and Restoration of Cultural Property (ICCROM) and dealt with different people’s perspective of cultural heritage within an institution using conservation documentation to show how one person’s view of an object in this case can be completely different to someone else’s. ‘Public and Private Studio Collaboration for Interns’ by Jacqueline Hyman and Pierrette Squires discussed the benefits gained by their interns who had the opportunity to work in a private studio and at Bolton Museum. The placements offered the chance to do practical conservation work and learn about broader aspects of collections care and exhibition installation. After tea the next session of papers began with ‘Standing on the shoulders of others: further developments in polychrome patterned nylon net’ written by Maria Jordan and Libby Thompson from Historic Royal Palaces. This paper outlined a treatment developed to protect very fragile textiles with nylon net which had been toned to match the fabric using digital printing and screen printing methods. The benefits and pitfalls of the work were discussed. This was followed by another practical paper from Elizabeth-Anne Haldane, Joanne Hackett, Sarah Glenn and Sung Im from the V&A entitled ‘Borrowing from the neighbours: using the technology of other disciplines to treat difficult textile conservation problems’, they described a series of treatments inspired by a workshop held at the museum by Richard Wolbers who specialises in cleaning systems for delicate objects such as paintings, paper and textiles. The final presentation of this session was ‘Conservation of a large chenille carpet from Cragside, Northumberland’ written by Aimee Grice-Venour from the National Trust. The paper dealt with the challenges of working on large scale floor coverings and how the studio had to adapt working practices to accommodate it. A short AGM followed the lunch break and then the afternoon session began with a paper by Alice Brown, Sophie Minnis, and Louise Joynson. ‘Tapestries in time: The role of time and our development in tapestry conservation’ looked at the Doddington Hall tapestry project which is ongoing and involves the team of conservators working in a studio which is accessible to the public. They talked about their working practices and the problems and benefits of doing such complex work in full view of the general public. Jennifer Cruise from the University St. Thomas Minnesota presented a paper called ‘Missing Links? Access, Utility and Communication’ discussing the scientific literature produced by and available to conservators, looking at how we use these resources and which external factors can affect the progression of this research. 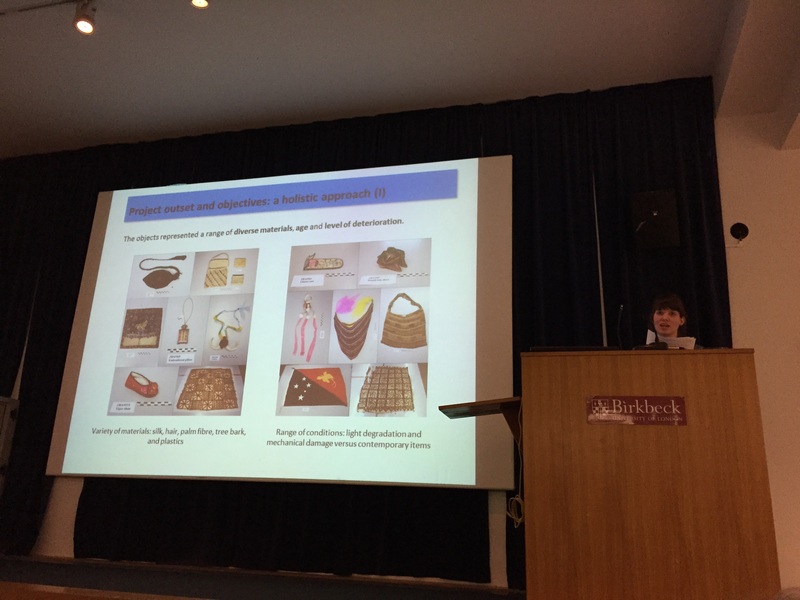 This was followed by a paper by Nora Meller from the Royal Museums Greenwich entitled ‘Learning from interdisciplinary collaboration during an internship at Royal Museums Greenwich.’ It discussed a project to stabilise and pack a collection which had been donated by the London Missionary Society and included a large number of ethnographic objects. During break periods there was the opportunity to view a selection of posters which had been produced, including one from Zoë detailing a treatment that she carried out when working at the Victoria and Albert Museum last year. The poster was about a complicated project she carried out to mount a German Calvary helmet dating from 1630, which will go on permanent display at the V&A later this year. The helmet was complete with its original padded linen lining, so Zoë had to work with the mountmaking team to find a way to display it, making sure it is safe and secure whilst appearing to hover in midair. An afternoon tea break was followed by a talk by Ann French from the Whitworth Art Gallery, reflecting on her career in conservation with ‘Thirty Years On: Connecting Personal Self-Reflection to Professional Change.’ Looking back at her experiences, she discussed the shift in value systems which challenge conservators to re-address the way we treat and display objects in our care. The final presentation of the day was delivered by Joan Kendall Textile consultant at Hatfield house. ‘Recruiting, selecting, Training and Managing volunteers for the Textile Conservation Group at Hatfield House, 1977-2014’ was a tribute to a long running volunteer programme from inception to the highs and lows of working with the groups and eventual end to the project alongside Joan’s retirement. In January the TCS team drove down to Hatfield House to collect a painted 19th Century Garter Banner which we are currently conserving in the studio . Next time you’re visiting the PHM, have a look at it through our studio window. In the build up to the General Election on the 7th May, we have been asking visitors to share their voting memories in the Election! exhibition here at the People’s History Museum. We have had a variety of responses, and visitors have shared memories such as voting in the EEC referendum in 1975, students in university celebrating the election result in 1997 and even bumping into exes at the polling station! A handful of people seem disillusioned, saying they have never voted and believe it doesn’t change anything, but overall the responses hav e been positive. Many visitors consider voting to be a democratic right and have written about the importance of having a vote in a democracy. One visitor believed that voting is a right we take for granted when others are risking their lives across the world to have a vote and another said that everyone has the right to be able to say how we live together in a society. 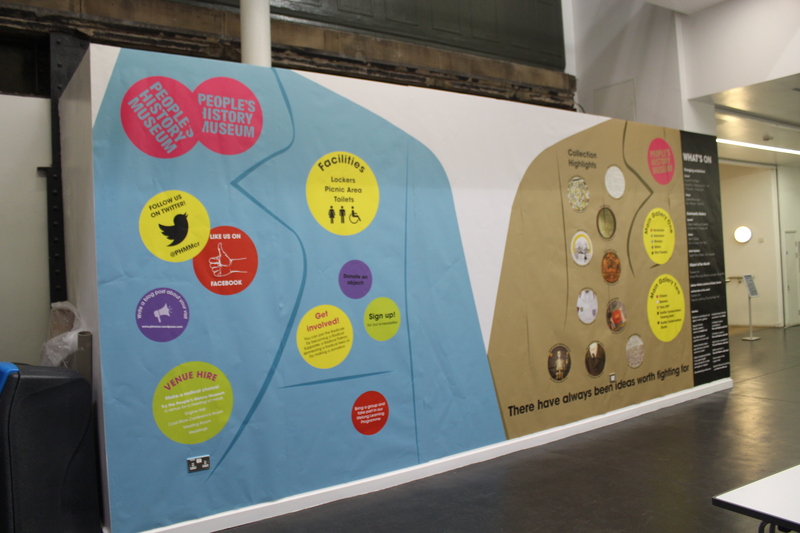 In our exhibition, we have also been asking if people will be voting in the General Election this year and why. Again, a lot of people have responded with exercising the right to vote because of the historic struggle for voting rights. But what is also interesting is the overwhelming response from young people who are not old enough to vote but wish that they could, as well as the excitement from first-time voters. What are your voting memories? Will you be voting in this year’s General Election and why? Join the Radicals – A big thank you! Our Join the Radicals fundraising campaign is a success! A thank you to everyone who has supported us so far. 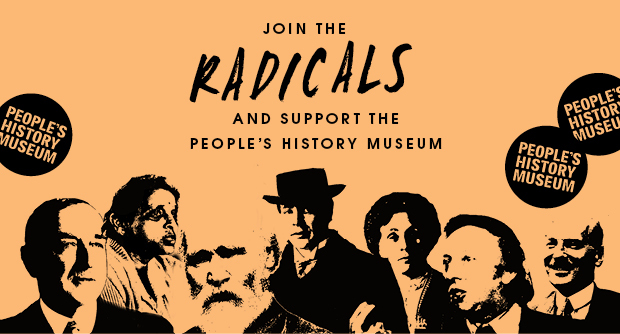 At the end of last year, the People’s History Museum launched a new fundraising campaign called Join the Radicals. 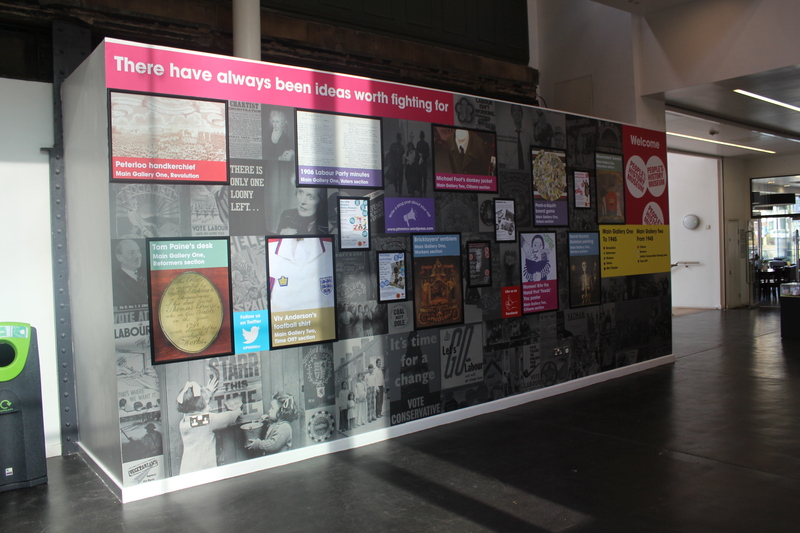 Our museum celebrates the stories of the radical thinkers who believed in ideas worth fighting for, the pioneers who changed history and made life better for working people. In these challenging economic times, we more than ever need the support of individuals and organisations who love the museum, people who want to contribute to our success and ensure the stories of the Radicals continue to be told. So we launched our campaign, with opportunities to support the museum in a number of ways; to become a Radical Supporter or a Radical Patron, or to sponsor a Radical Hero. And of course, we still encouraged donations of all sizes, every penny helps. The good news is the campaign has been a huge success so far, thanks to our generous visitors and donors. In the last 12 months, with all your help, we have raised a whopping £169,983.11! This is 12 times as much income as the previous year. So we want to say a huge thank you. Over £22,000 has been donated to the museum through our donation boxes, online and in other ways. This is almost £10,000 more than last year. £2834 was raised at our Never Mind the Politics fundraising event day in March. The Radical Supporters scheme (£30 a year) now has three times as many members as last year and is, growing every week. One of the big successes of the campaign so far is our Sponsor a Radical Hero scheme, which costs £3000 (or £1000 per year for three years). This gives individuals and organisations an opportunity to personalise their support by putting their name against one of our Radical Heroes. The list consists of politicians, writers and artists, pioneering sports people and campaigners, and reflects the range and diversity of the museum’s collections. We are delighted that 45 of our Radicals have already been sponsored! Amongst them are Clement Attlee, Nye Bevan, Winston Churchill, Hannah Mitchell, George Orwell, Tom Paine, Emmeline Pankhurst, William Wilberforce and the Victims of Peterloo. Sponsor Laura Harper, who sponsored her Radical Hero William Wilberforce for her family Andy, Grace and Thurston. 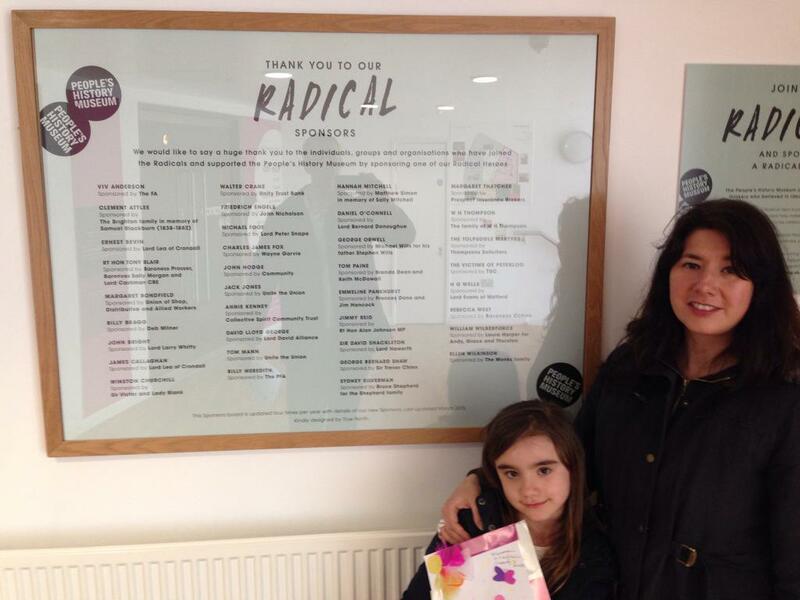 Viewing the Sponsors thank you board in the museum, with her daughter Grace. But we still have lots of Radicals left to sponsor; among the great ones still available to support are Tony Benn, Barbara Castle, Keir Hardie, Paul Robeson and Mary Wollstonecraft. Plus, people can nominate their own Radical Hero if they are not on our list and are complementary to the museum and the story of democracy and equal rights. For example, Alan Johnson MP, right at the beginning of the campaign, nominated and sponsored his own Radical Hero, the Scottish Trade Unionist Jimmy Reid. Check out the live list of which Radical Heroes are still available to sponsor. So, lots of good news, but the story is not over. The Join the Radicals fundraising campaign continues and we would love more people to get on board. The museum is registered charity, with free admission. Income from our Join the Radicals campaign goes directly towards our collections, exhibitions and Learning Programme. Whichever level you join at, there are a range of benefits, from regular email newsletters and invitations to private views, discounts in the museum shop and cafe, right up to Sponsors’ credits in the museum and special events. And of course, every time you visit the museum, attend an event, hire one of spaces, or spend money in our cafe and shop, you help to support us. So thank you to all of you. 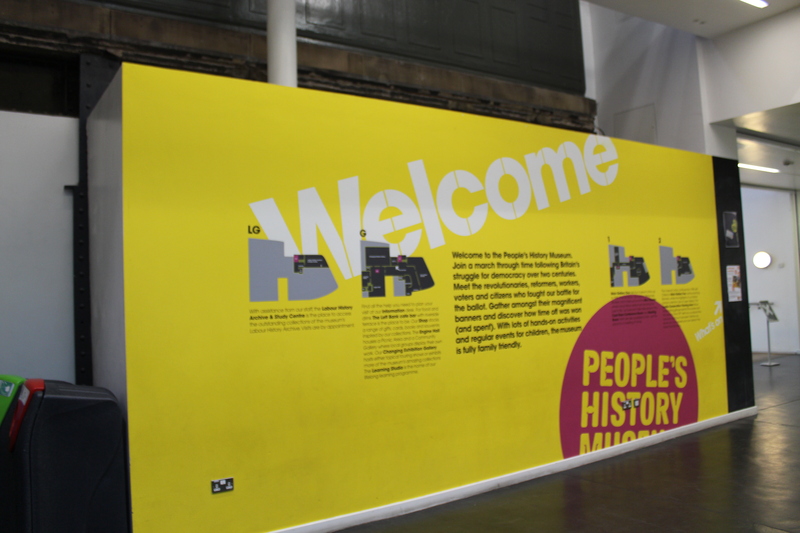 Find more about joining the Radicals and supporting the People’s History Museum or contact giving@phm.org.uk. 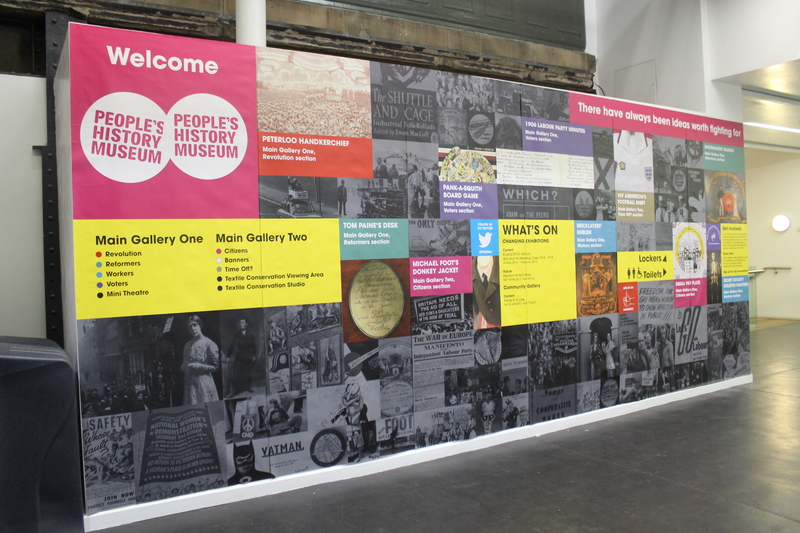 We’re very excited that our new Welcome Wall has been installed today. The new design shows off some of our great collections and gives us the flexibility to highlight our fantastic events and exhibitions and how you can get involved in the museum. However our lovely designers Fuzzy Duck didn’t just dream this design up overnight. Over the past few months we’ve been testing out their ideas and observing our visitors to see which design they engaged with the most. This blog post will give you a bit of an insight into the process behind the Welcome Wall redesign element of the Play Your Part project. The original design of the Welcome Wall was installed when the museum reopened in February 2010. 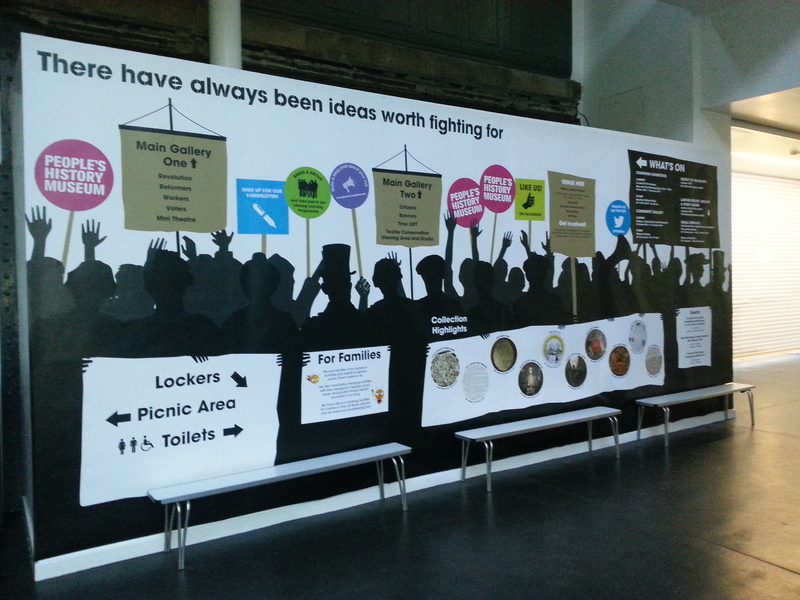 Text heavy, the design didn’t meet the needs of our visitors and was not an accurate reflection of the museum. We wanted to embrace the experimental nature of Play Your Part and test out a number of approaches to redesign the wall in order to ensure that the final design was audience focused and has longevity. After researching examples of foyer spaces in other museums, we came up with a wish list of what we wanted our new Welcome Wall to look like. However we knew that it wasn’t just us that mattered – the design needed to be something informative and eye-catching for visitors. 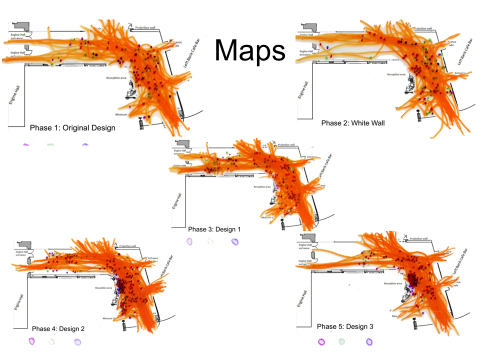 We needed to objectively measure how the different designs impacted on the visitor experience. For this we brought in audience research specialist Marge Ainsley to train us up on observational research and for the past few months we have been dutifully observing how visitors use the foyer and their levels of engagement with the various Welcome Wall designs. The data made for interesting reading. We found that on average 40% of visitors interacted with the information desk during their visit, with 23% of visitors going straight to or from the cafe, 14% going straight in and out without visiting the museum and only 20% of visitors going straight to the toilet or museum without interacting with the information desk. This highlights the importance of our Front of House team as the first point of contact for visitors. We found that the number of visitors not engaging with the Welcome Wall significantly decreased in all three of the test designs, compared to the original design. 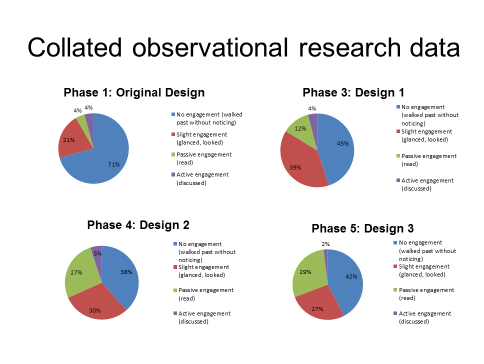 Test designs 2 and 3 showed similarly greater levels of passive and active engagement compared to design 1. Therefore when analysing the impact of the three test designs, we focussed on designs 2 and 3 to take forward to the final design. The final design is based on test design 3. Whilst most visitors do not pass the Welcome Wall at the start of their visit, the museum hosts many public and private after hours events. During these events the museum galleries are often closed, and the foyer is used as a breakout area, or for food and drink receptions. Therefore we wanted to highlight the museum’s collections and encourage guests to return when the museum is open. As only 21% of visitors go past the Welcome Wall at the start of their visit, we decided to keep the information as simple as possible to avoid conflicting messages. Most of the information is framed to allow for flexibility. 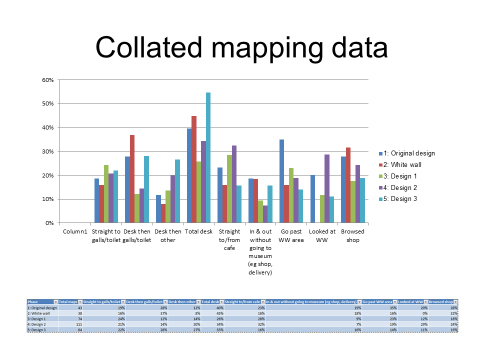 Collections highlights are in A1 frames, which we can’t update in-house, but will mean that they are easy to update in the future. What’s On information is in A3 frames, which we can update in-house. This will allow us the option to test out different approaches, for example highlighting Family Friendly activities during the school holidays, or to sell the frames for corporate branding during venue hire events. 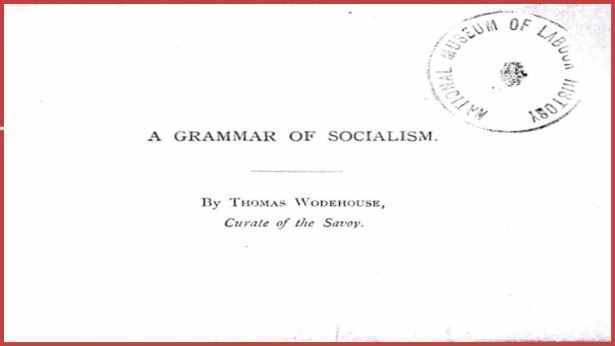 A guest blog by Kayley Davies, Alexandra Gunn, Ben Littlejohns, James Lansdale and Julia Smith from the University of Manchester about Thomas Wodehouse’s 1884 pamphlet A Grammar of Socialism. The students visited the Labour History Archive & Study Centre as part of their Archival Project for ‘Christianity, Culture and Society 1750-2000’. A Grammar of Socialism is a pamphlet by Thomas Wodehouse, the curate of the Savoy, and published in 1884. The source is written in a question and answer style and was sold for a tuppence. The text addresses the population as a whole and transcends class barriers. It is likely to have been used to educate people of the ideas and definition of Christian Socialism, including questions such as, ‘what is Socialism, and what is its aim?’ Through the question and answer structure, the pamphlet is able to put forward the basic and also more elaborate ideas of Socialism. These main ideas focus on right and wrong and the three maxims that all should work, consume only what they need and distribution their remaining wealth. It is important to remember that as the author is writing to promote Christian Socialism, he is writing with an element of bias. The end of the 19th century was no less tumultuous than the start. Although working men had been granted partial suffrage under the Reform Act of 1867, the impact of the Charter Movement continued to be felt. The increasing awareness of the need for change is most obvious in the establishment of the Socialist Democratic Federation in 1881, and the subsequent split with the Socialist League in December 1884. Upon its foundation, it ran on a very progressive platform, calling for a 48 hour work week, an end to child labour, and equality for women. Though it is somewhat outdated, Torben Christensen’s Origin and History of Christian Socialism, 1848-1854 provides an excellent introduction to the context in which Christian Socialism emerged. By detailing the need for money to alleviate the problems the poor faced, the demand for support from the upper classes is important to Christian Socialists. By assisting the poor with their monetary concerns, Christian Socialists seek to rid the issue of poverty within the working classes of their society. As the movement acted on behalf of the poor, it can show the lack of interaction the working class had within religious institutions. The pamphlets desire to distribute large sums of money amongst orphanages could be linked to the Sunday School movement that arose throughout the 19th Century, striving to provide a basic literary education to children through a biblical context. This pamphlet is emblematic of certain Christian socialist ideals and therefore is a particularly interesting and useful text to highlight. Christian socialism emerged in response to the widespread poverty that was afflicting the working classes in late Victorian London. The text reveals their core belief that Christians should be active in society on a practical level. The insistence on the redistribution of wealth shows us that although spiritual and moral reform was a concern, it never constituted a focus for the Christian socialists. Instead, they believed that those in poverty must first be alleviated from their situation before they could be reformed spiritually. The pamphlet’s emphasis on the physical conditions and suffering of the working class represents the contrasting position the Christian Socialists had to the evangelicals in this period, who were distinctly concerned with moral regeneration and ‘soul-saving’. Leech, Kenneth. The Sky is Red: Discerning the Sign of the Times. 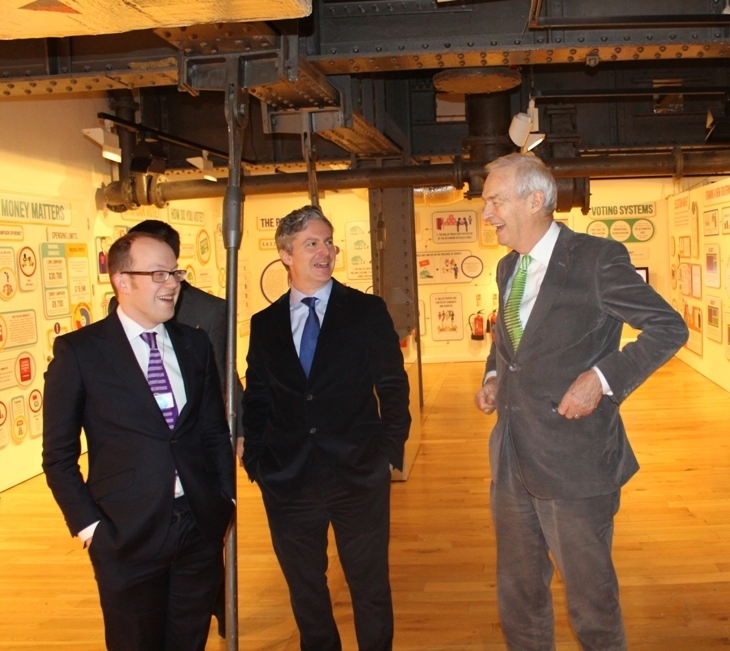 London: Darton, Longman and Todd. Norman, Edward R.. The Victorian Christian Socialists. Cambridge: Cambridge University Press, 2002.